What is the material? Ultra soft synthetic leather and good quality tungsten steel color hardware. 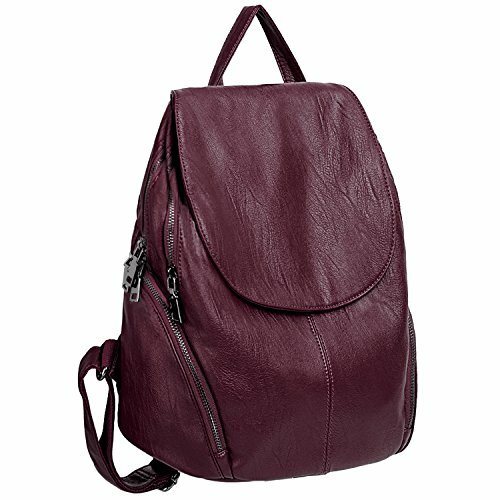 Any design of the backpack? Magnetic flap-over closure design. Full-lined black fabric lining. Detailed streamlined and reinforced double stitching on every seam. How many pockets of the backpack? Interior: 2 main large zipper compartments contain 1 internal zip pocket and 2 open pockets. Exterior: 1 back zipper pocket and 2 side zipper pockets(cellphone up to 4.7¡± may not fit in side pockets). What are the dimensions? 12.99"L x 4.72"W x 12.40"H. Weight: 2.12 pounds. Adjustable back straps: 33.86"(longest size). Handle drop: 11.02". This backpack is perfect with any outfit in any occasions like work/business/shopping/dating/travel/school. If you have any questions about this product by UTO, contact us by completing and submitting the form below. If you are looking for a specif part number, please include it with your message.